Log cabin has long been a favourite of mine. 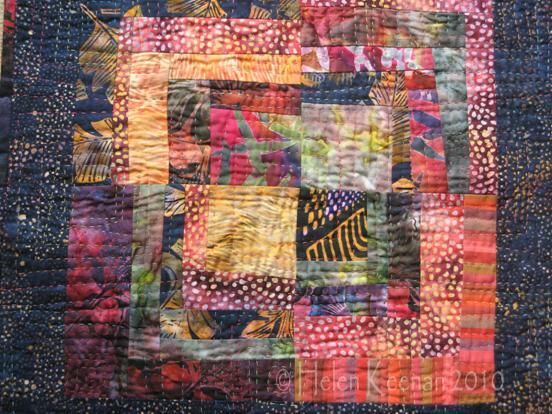 This workshop explores making amazing log cabin variations with freely cut strips, using either scissors or rotary cutters, and shows how the blocks can be put together to make lively and colourful quilts or hangings. Students should achieve an intriguing hanging or small quilt top in a day. Free yourself from matching points and straight lines! Make freely cut curved blocks – no fiddly templates – then play with arrangements to create a wonderful curved design. Great fun, and I guarantee no two quilts will look the same! Use quick-piecing techniques, rotary cutter, board and machine to make a fantastic patchwork top which can be made into a hanging or cushion, or even be the start of a quilt. Learn to cut and piece without measuring or using fiddly templates, and just use your ruler to square your work up at the end! Cut, join your fabrics, then cut and rejoin to make beautiful patterns and textures – all without accurate measuring and unpicking! There are endless ways to use this method, and above all it enables you to work quickly and captivatingly to produce a quilt top. So …. cut and come again, and learn to enjoy your rotary cutter in a whole new way! My current workshops all use free cutting and piecing techniques, and are devised to allow students to work quickly and experimentally through techniques to produce an exciting and interesting quilt top, often even quilted too, depending on the duration of the workshop and the speed of stitching! Cabin fever is very loosely based on the log cabin block, whereas the other two techniques use free cutting and joining to make unique blocks and designs. All classes are suitable for one or two days, according to requirements, and are taught with enjoyment and achievement at their heart. All workshops are suitable for both beginners and more experienced quilters.